(Photo: LWF / Felix Kalbe)Bishop Gerhard Ulrich, chairperson of Lutheran World Federation German National Committee and Bishop Ilse Junkermann of the Evangelical Church in Central Germany enter the Town Church in Wittenberg for the opening worship service of the LWF Council, its main governing body meeting. Shanghai, Kolkata, Jakarta, Tokyo, New York City, Hong Kong, Miami and New Orleans are not cities linked to the geography of the Reformation that was happening 500 years ago in Wittenberg. "These are among the thousands of cities around the world that will be hit by rising sea levels as a consequence of climate change," said World Council of Churches general secretary, Rev. Olav Fykse Tveit. He was speaking at the meeting of the main governing body of the Lutheran World Federation, its council, in Wittenberg, Germany, where 500 years ago "waves of change reaching every country on earth were created". 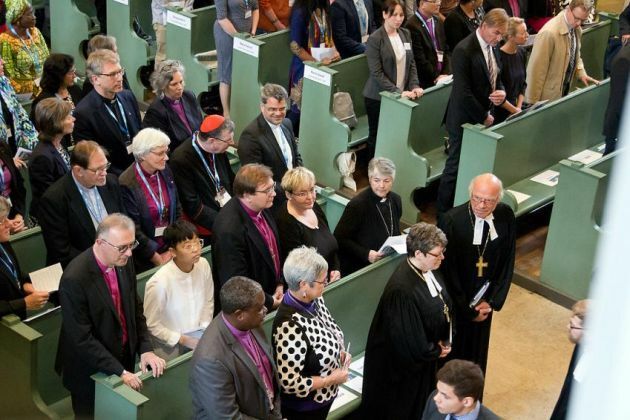 The WCC general secretary stressed in his June 15 speech that "creation is not for sale" and that the issue of climate change is a spiritual one of faith. "Creation is God's work, every day, according to Luther. Creation ultimately belongs to God. We are accountable to God for what we do as partners in God's creation, as deacons of God's creation. "Do we bring hope for human beings and the whole of creation? This is the question we in the Christian Church must ask one another," said Tveit. He asserted, "We need to change drastically how we produce goods, organize trade and operate in the financial system. We are currently living in a world driven by the globalized economy and dominated by financial motives – a world where almost everything has a price tag. "'Creation is not for sale' is the stop sign telling us not to go deeper down this road, but to turn around and look for the way of justice and peace. "'Creation is not for sale' reminds us that the 'turn around' required of us is indeed a matter of faith," said Tveit. That is "because it depends on the way we look at this world – just as an environment to satisfy human needs and even human greed, or rather as the web of life to which we belong as creatures of the God of life." Tveit said the gracious gifts of God cannot be reduced to natural resources and commodities. "Air, land, water and energy - all that is essential for life - need to be treated responsibly as common goods. "Hence, climate change as a matter of justice and peace is indeed a deeply spiritual matter – just as the Ecumenical Patriarch Bartholomew I has so often underlined," said Tveit. The WCC general secretary stressed in his speech that "creation is not for sale" and that the issue of climate change is a spiritual one of faith. "We need to change drastically how we produce goods, organize trade and operate in the financial system. We are currently living in a world driven by the globalized economy and dominated by financial motives – a world where almost everything has a price tag," he asserted. He noted that already Pacific islands like Tuvalu are affected whilst explaining that action versus inaction can mean the difference in displacement of between 145 million people and up to 760 million people living in the world's coastal cities. "Walking as pilgrims on the way of justice and peace requires turning around at the stop sign. The biblical term for such a turnaround is 'metanoia'/'repentance'," he noted. This leads directly to the first of Martin Luther's 95 theses, posted in Wittenberg, which are considered to be the starting point of the Lutheran Reformation. "When our Lord and Master Jesus Christ said 'Repent', he willed the entire life of believers to be one of repentance," (Mt 4:17) said Tveit. Repentance means change, or a change in direction, said Tveit, elaborating on why it is necessary. "Luther said: Because sin is a reality. Our era gives us no reason to think otherwise. This is not a time to believe that humanity is done with sin. "There is no way to get away with it through money, through ignorance, through pious practices or by secular arguments – saying that we do not believe in it," said the general secretary. He said this is a "destructive reality" in people's lives. It can take the form of structural sin in political and economic systems. "Repentance is an attitude open for change to what is good. It means alertness to the critical voice, understanding the dimension of tragedy, and willingness to name what is wrong. "Repentance comes from hearing clearly the voice of God's forgiveness. We can change to focus on the needs of the other; particularly those who need more attention for the sake of justice and peace – our neighbours in need and the suffering creation," said Tveit. He warned that unrestrained markets are a large part of the problem as they place a price on nature. They use market-based approaches peddled by some political leaders and global financial institutions as solutions to ecological and climate crises. Tveit cited carbon cap and trade schemes, forest carbon markets, biodiversity banks, even global water markets. "Usually, the price for such instruments fails to reflect the real costs for human beings and nature. Marginalized and silenced, they cannot claim their rights." Change and repentance from humanity can shape a new vision for living together. "Such vision provides a strong base that calls for humility and mutual care for all who are ready to turn around and embark on the pilgrimage of justice and peace. "In this way, we are making the best values of the Reformation a living reality today," said Tveit. "Values are of no worth if they are solely about the past. We strengthen our values best by using them today as the basis for serving the lives of other human beings and the future of life on earth."